The great thing about the BBC’s vast TV archive and its iPlayer technolgy is that it’s relatively easy for them to offer long-forgotten programmes for new generations to enjoy. A highlight of my childhood was the Children’s BBC ‘Broom Cupboard’. 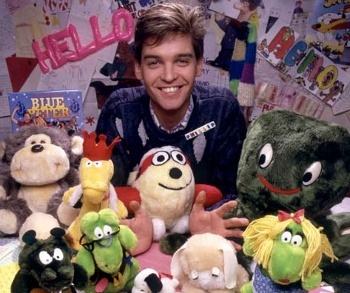 Presenters like Philip Schofield and Andy Crane filled the gaps between programmes with banter and hijinx involving puppets like Gordon the Gopher, Edd the Duck and occasionally a butler called Wilson. Now, to mark the 25th aniversary of the Broom Cupboard, the BBC has released clips that many won’t have seen since they were young. As part of the BBC Archive site, the Broom Cupboard collection features a variety of clips from programmes that showed ‘behind the scenes’ at the daily broadcast. You’ll see Edd the Duck on a trampoline, various mistakes that went out live on air and (sob) Andi Peters’ last day on the show. Some of the footage has been pulled from the BBC’s official transmission archive and some from VHS recordings meaning quality is variable. However, if you’re aged somewhere between 25 and 35 I highly recommend you sit down and spend some quality time reliving the couple of hours between the end of school and tea time when you were young.